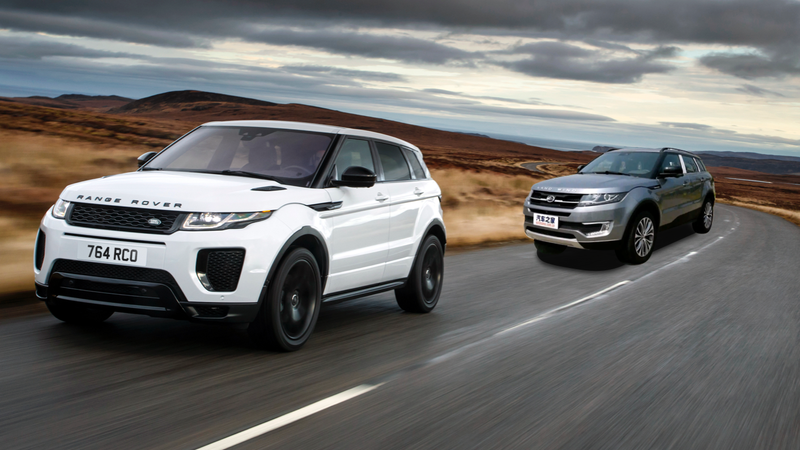 In 2014, a Chinese-built Range Rover Evoque launched at the Guangzhou Auto Show. Nearby sat the Landwind X7, a cheaper copy of the SUV sold by a Chinese company for a fraction of the price. But Friday, a Beijing court ruled in Jaguar’s favor—determining that the X7 copied five features of the Evoque. Now it’s coming to an end and the copycat company owes JLR some money. The case was in court for three years, with JLR suing the manufacturer of the X7, Jiangling Motors Corporation, back in 2016. The Guardian reports that it all culminated in the court ruling that Jiangling Motors, which Ford holds a stake in, must stop production on the X7 immediately and pay JLR compensation. Jaguar Land Rover (JLR) described the ruling as a first in the global car industry. Western firms have long complained of cheap replicas being made in China but have struggled to secure legal redress. Keith Benjamin, JLR’s head of legal, said: “We welcome this decision of the Beijing court, which further strengthens our confidence in investing in China and in the fairness of intellectual property adjudication in the Chinese courts. Jiangling Motors offered the X7 at about $18,500 at current exchange rates, according to the Guardian, compared to the Evoque’s starting prices in the $50,000 range. A cheaper version available elsewhere affects a luxury brand’s image, and JLR naturally hasn’t been too happy with the company since the X7 debuted five years ago. As a company we have invested heavily in China with our joint venture partner Chery. That commitment is based on a clear business plan, that allows us to hit our sales targets at clear prices. Anything that damages the potential profitability of our plant damages the integrity of those plans. I will talk to our officials and I will talk to our partners at Chery to find a way around this situation. I cannot imagine Chinese officials will be happy at any actions that undermine the credibility of the country. What we have seen today is not correct. Knockoffs of popular vehicles by manufacturing firms in China have been going on for years, but two particular copies have stuck out in recent years—the X7 and a Zotye SUV, which looks suspiciously like the Porsche Macan and which the Guardian reports Porsche considered taking legal action over in 2016. One is no longer in production, thanks to JLR’s win in court. Whether or not this JLR win that was three years in the making sets a precedent for future copycat vehicle models remains to be seen, but, if anything, one thing is obvious: Any action on copied cars probably won’t be too swift. Chinese Porsche Knockoff Maker Wants to Be First Chinese Car Brand Sold In U.S.